The University of Minnesota Student Chapters of the American Society of Civil Engineers (ASCE) and American Public Works Association (APWA), along with the Civil Engineering Department, invite your organization to sponsor a booth at the upcoming Civil Engineering Career Fair. 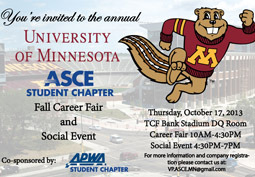 The ASCE/APWA UMN Student Career Fair will be held on Thursday, October 17, 2013, from 10 a.m. to 4:30 p.m. in The DQ Suite at TCF Bank Stadium. The fair is an excellent opportunity for civil engineering firms and agencies within the industry to display their projects and increase student awareness about the profession. The Career Fair will conveniently and effectively allow you to recruit for internships, co-op programs, and permanent positions. To attend, organizations are asked to donate $360 to secure a table for your booth, lunch for two associates, and inclusion in the company guide. Please register and submit payment by October 3. Complimentary WiFi will be provided as well as power outlets on request. Participants are asked to provide a 100-word description of ther company for publication in the guide to be handed out at the fair and published on the event website. Additional advertising opportunities in the form of a Power Point presentation are also available for an additional cost.